The SpaEase 200 is the ultimate in hydraulic cover lifters and it’s also the easiest to use. 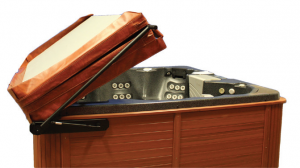 Built to the highest quality standards, the SpaEase 200 is the only hot tub cover lifter that uses steel where it’s needed, and aluminium where it’s required. The SpaEase 200 is the same lifter used in the VacuSeal system but can be used for all tradition styles of cover up to 244cm / 96”.